1. 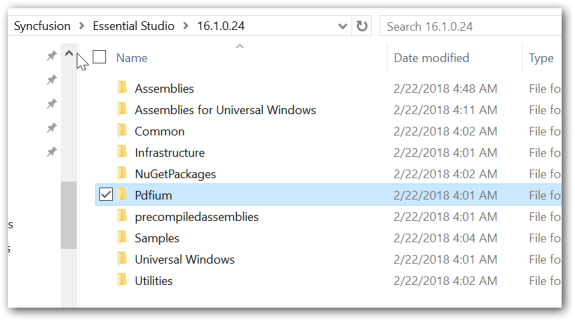 Copy the Pdfium assembly’s folder to a local folder from the installation path. The folder name must be “Pdfium”. Note: The Pdfium folder contains two folders namely X86 and X64, and both contains pdfium.dll assembly for the respective architecture. The Syncfusion PDF viewer is designed to detect the architecture of the target machine in which it is deployed and pick corresponding pdfium.dll to use it. 2. Then, the ReferencePath property of the PDF viewer should be set to locate the “Pdfium” folder.The following code snippet illustrates how to export the PDF document into images using the PDFium. I've followed these steps exactly and am getting a could not load dll error for pdfium. We suspect that the ReferencePath for the Pdfium assembly may be incorrect so the “could not load dll error” issue occurs in your end .So kindly ensure the provided location contains Pdfium assembly. The parent folder has to be provided as the path in the ReferencePath API. If the above provided solution does not resolve your issue. Kindly provide more details about that issue ,So that would be helpful for us to analysis more and assist you better.